There’s a rat in a cage with two sides: one bright and one dark. 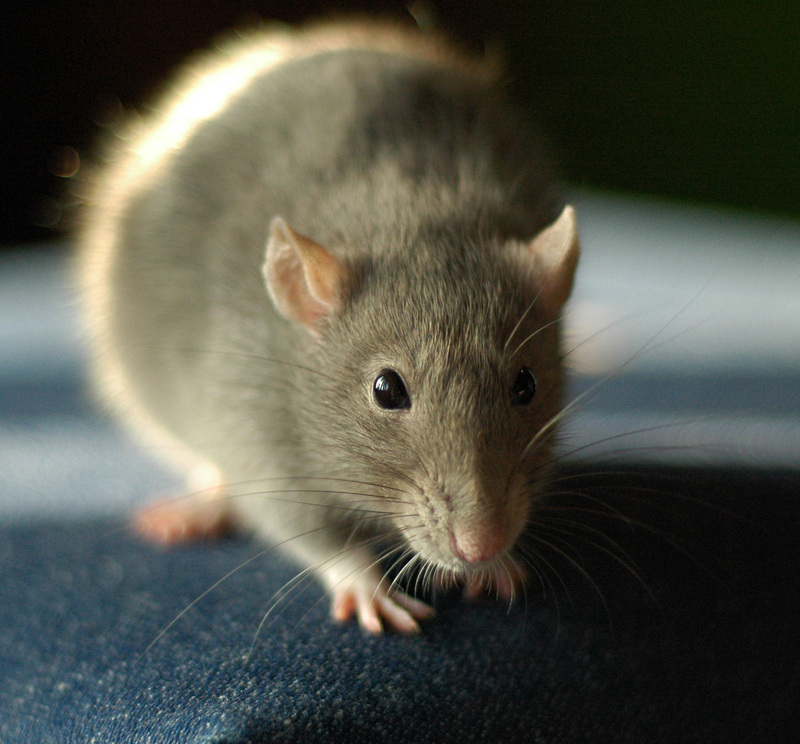 One of the rat’s survival mechanisms is to favor the dark side and avoid the bright side at all costs. But when the rat goes into the dark side of the cage, it gets shocked. After a few shocks coincide with its favorite habitat situation, it remains on the bright side despite its lifelong instincts. Is the rat now afraid of the dark, or is he simply trained to avoid it? If the rat were a human, he’d probably tell us he’s afraid of the shocks in the darkness, which shows the ability to feel emotions. We know humans have the capacity for consciousness because we think, make decisions, have feelings and a sense of self. And each of us believes that other humans have the same ability. But we don’t yet have the technology to go into the minds of those around us to see and feel what they do. This distinction is all the more difficult when it comes to non-human animals. We think that our pets are happy when we come home, or sad when we punish them for ruining the brand new couch. But we can’t go into their minds to really know how they’re feeling, or whether they are actually conscious. The animal consciousness debate has higher stakes than a simple desire to know whether Fido or Fluffy has feelings. It affects how scientists think about and conduct their research on non-human animals, and whether researchers should or should not make assumptions about their subjects’ consciousness while doing their experiments. One side believes scientists must separate the mechanisms that detect and respond to threats from those that create conscious feelings of fear, while the other believes these mechanisms are one and the same. But this is not a new debate. But another group of neuroscientists — one of the most vocal being Jaak Panksepp, a neuroscientist at Washington State University — want to factor consciousness into their experiments. In July 2012, at the conclusion of the Francis Crick Memorial Conference on Consciousness in Human and Non-human Animals, Panksepp, along with a White House advisor and other neuroscientists, published The Cambridge Declaration on Consciousness. This declaration, whose signing was witnessed by physicist and cosmologist Stephen Hawking, emphasized that scientific evidence showed clearly that non-human animals have “conscious states along with the capacity to exhibit intentional behaviors.” They argued that all mammals and birds, as well as many other organisms, have the same brain structures and substrates that make consciousness possible in humans, which makes consciousness possible for them as well. John Watson, the early 20th century psychologist known as the father of behaviorism, which focuses on studying outward behavior rather than inward consciousness, had a very similar view. Watson and other behaviorists thought that the only way to understand animals was to observe the causes and effects of their behaviors, rather than to ruminate on whether the animals made conscious behavioral choices. They insisted, for example, that a chastised dog cowering in a corner isn’t feeling fear: He’s actually exhibiting a reflexive behavior triggered by a stimulus — a position bolstered by Russian physiologist Ivan Pavlov’s experiments with salivating dogs. Some researchers, like the founder of psychoanalysis Sigmund Freud tried to delve into how human behavior was influenced or driven by inner feelings and desires. But animal behaviorists almost unanimously focused solely on the observable behaviors themselves, rather than trying to experimentally manipulate or even delve into animal consciousness. The classical behaviorist point of view has reigned since the 1950s, but there was a silent minority toiling away to try to prove that non-human animals have consciousness. Panksepp was inspired by the work of American psychologists Peter Milner and James Olds, who in 1954 discovered the brain reward system. By using electrodes to target certain brain regions in rats, Milner and Olds found they could train the creatures to perform behaviors like pressing levers so they could get more of this deeply rewarding brain stimulation. The brain’s reward system is activated to reinforce certain behaviors that cause pleasure and researchers believe this system is responsible for drug addiction. Panksepp began using similar deep brain stimulation techniques in his own research. But rather than lying back to enjoy this reward system stimulation, the rats would actually change their behaviors. “Every animal I stimulated in the rewards system explored [its environment],” he said. “I immediately started seeing this as an emotional system as opposed to just a reward system. It was through this emotional system that animals explore the world,” Panksepp added, and can thus better anticipate threats to their survival. Panksepp called this branch of the reward system the seeking system. Since then, he and other pro-consciousness scientists have concluded that animals have systems not only for seeking, but also rage, lust, maternal care, panic, play and fear. Researchers were able to map the brain’s so-called play system using rat laughter, a sound that’s too high for humans to hear but sounds like bird calls when manipulated into the human hearing range. “Every animal I tickled was chirping like crazy and they became very fond of my hand like a little puppy chasing you around,” Panksepp said. One of his doctoral students began to map the brain areas that caused the rats to laugh, and found that this laughter was, according to Panksepp, a “marker for good feelings” or social joy. But LeDoux argues differently. He thinks that the neural circuitry associated with fear conditioning, which he argues is a response to a threat, is separate entirely from any circuitry that could create conscious fear. LeDoux says that in a variety of experiments in humans, subliminal threats were able to cause physiological responses, such as increased skin conductance caused by sweat, without subjects being aware of the threat, even when they are asked to describe how they are feeling at that moment. This uncertainty explains why LeDoux and his camp call this reaction a threat response rather than fear. Like LeDoux, Braithwaite acknowledges we still don’t have all the information on human consciousness, but in the animal consciousness debate she sides with Panksepp. This isn’t simply a war of competing factions who just want to be right. According to both Panksepp and LeDoux, whatever direction the field goes in will affect how scientists look for new human psychiatric medications and how animals in research laboratories are used in experiments. While Panksepp believes researchers should take animal emotions into account when looking for these new medications, LeDoux believes scientists must separate the mechanisms that detect and respond to threats and the mechanisms that create conscious feelings of fear. LeDoux says behavioral therapy addresses non-conscious brain circuitry more directly, while cognitive, or talk, therapy addresses the conscious circuitry. But many therapists use both methods. He argues that from a neuroscientific standpoint this is not as effective at helping patients, because the different predisposing factors that cause psychiatric problems are susceptible to different treatments. There’s a lot more at stake for the rat in the dark and light cage than most would expect, and the way researchers handle their thinking of the rat’s conscious and unconscious experiences has great implications for human applications. For now, this shocking controversy continues on. Couple of things struck me as I read this interesting piece. One is that human psychiatrists most often seem to approach their human patients in the same way: that is, they treat the behaviours *they* perceive rather than delving more deeply into the consciousness that reposes in the human patient before them. Perhaps human patients are simply animals to them? And, anyway, drugs are cheaper than in vivo research. Behaviourism is all but discredited nowadays. At the very least it’s been superseded by more accurate and better informed perspectives, often via the more accurate research use of MRIs/FMRIs than the observations of a superior, highly ‘scientifically’ educated psychologist. Spelling it out, I don’t believe psychologists or psychiatrists should be allowed anywhere near animals, human or otherwise! Which leads to my second observation: I’ve had the privilege and pleasure of the companionship of a good many dogs throughout my life and the friendship of several more. Each dog has its own, distinct personality: its own unique way of understanding, responding to and manipulating the world around it. Some dogs I’ve known are clearly self-directed comedians, others are cussed or morose. All have moods and can make their feelings emphatically known regardless of ‘behavioural cues’ and ‘training’. Some, perhaps many, dogs are more empathic to humans and other animals than most humans. If all this doesn’t denote consciousness, I don’t know what does. It seems that both approaches lead to a medicalized vision of behavior ‘problems’. Both approaches may be different but assume that a medical/drug therapy is the right way of treating patients. Maybe both need to address this question. I have met many horses, and they have demonstrated to me that they have an idea of where they are in space relative to other horses, clear desires including social ones and responses resembling pleasure or frustration in response to them, curiosity and problem solving ability, and a complex system of relationships with other horses. They often have what looks like satisfaction and enjoyment of work, and they seem to have complex emotions and good memories, resulting in them having different personalities, and this combined with what seems like an awareness of how humans feel means they can respond appropriately (or choose to respond inappropriately). Maybe I am just projecting my unique, individual, coveted, special human condition onto these robot-like automatons. Maybe this is something I usually do with other beings who also seem to be human. In summary, I don’t think we are able to prove that animals are conscious any more than we are able to prove that another human is. The debate will go on maybe for decades even longer until new technologies are discovered to probe into the head of animals and consciousness are detected.With no evidence to standby the ideas, all is theory or guessing. But personally, I prefer to believe that all animals actually have consciousness. I think they have consciousness, anyway, they are living things. Animals are sentient beings as are plants. I believe that humans may simply express this in a more complex manner. As long as we can claim that animals are not conscious we can continue to exploit them for food, for their fur and feathers, for their work and as entertainment. The economic consequences are enormous, so perhaps that is why their is still a debate? We will only really be able to determine if animals too have consciousness when we define a universal concept for consciousness. If the only consciousness we can currently know, and be sure of, is our own, that is, human consciousness, then we can’t assume other animals are conscious too unless we assume their consciousness works exactly the same way as ours, that they’re the same in nature. Which, as long as we consider (our) consciousness a function or byproduct of the brain, or that its existence is, at the very least, entirely dependent on the central nervous system, can’t possibly be true because our brains are not functionally nor structurally the same. But then, if you choose to divide consciousness between human and non-human, how could we ever know the true nature of non-human consciousness? How can we define other kinds of consciousness if the only one whose existence we can be sure of is our own? We’d have accept that we will never be able to prove, but only assume they exist. Either that, or consciousness isn’t actually real, but just a delusion resulted from our brain’s activity during its response to internal and external stimuli – a mere, useless, byproduct of it – resulting in a fake sense of self, with no real control over the body, meaning that WE don’t exist. I think that refusing to admit animals have consciousness suits those who need to feel superior to them and want to continue to exploit them for tests, food, fur, entertainment, etc. People who test on animals certainly show no empathy, indeed cruelty, as animal do feel pain, whether you agree they have consciousness or not. This was a well written article and it addresses points for both arguments. I consider myself an empirical person because we need to be able to observe things to ensure they are real. If we could observe god, we would know he/she is real. When psychologists do experiments, they attempt to remove as many extraneous variables as possible because it makes it easier to empirically conclude something from the results. If anything, I wish that animals possessed consciousness. It would make this world feel less lonely to me. But, I agree with Michael, above, who said that we can’t determine animals have consciousness unless we operationally define it. It seems to me like a lot of people, especially vegans, want to believe that animals are conscious–that they are self aware. The problem is, I don’t actually see any conclusive, empirical evidence proving that they are. I read through multiple articles arguing for consciousness, and they all conclude that animals are conscious through assumption and correlation. While I do believe that is their prerogative to do that, I don’t believe they can conclude it with certainty. I don’t know how we’d test for consciousness, and I don’t know what proof I’d need to believe in it. All I know is right now, I’m erring on the side of not-conscious. It’s like being innocent until proven guilty. You don’t assume the man murdered his wife until you have proof; until then, he didn’t murder her. I know this isn’t exactly the same, but it’s similar. Certainly, some people have agendas which would be benefited if animals were found to be conscious or unconscious. Despite that, I am not one of those people. I just believe in truth and observation. Making assumptions isn’t unheard of in science, but you know what they say about when you assume. Animals may look like they feel pain, the scans may show their brain feeling pain, but conscious and unconscious pain are two different things and you need look no further than humans to see that we can experience both and they can be separate or together. If anyone reads this who disagrees, please feel free to point out how I’m wrong. To me, this isn’t about being right, it’s about the truth. While observing certain animals you can see they feel happiness and sadness, pain and pleasure, contentment and grumpiness and fear and peace. I see it as typically arrogant for humans to feel superior to other creatures by claiming they have no consciousness, much the same way one race would enslave another while calling them sub-human. We may not be able to observe consciousness in animals, but then we cannot observe it in humans either. To dismiss consciousness in animals would be doing them a great disservice as we should always take others thoughts and feelings into consideration, and if it turns out humans are the only creatures with a conscience then all we would be have done is prove to ourselves we can show compassion to those we consider different.